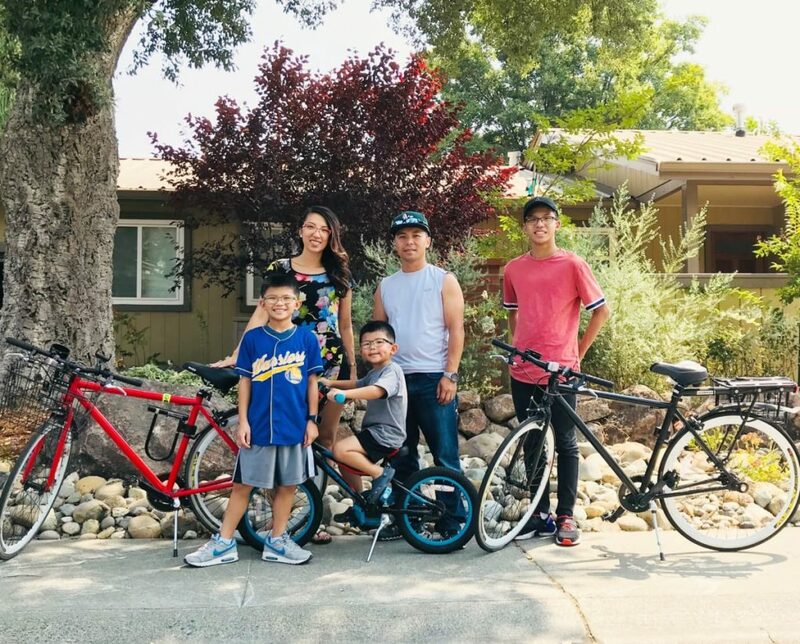 Jenny Tan, a UC Davis alumna, went from driving every day to and from her job as the Public Information Officer for Yolo-Solano Air Quality Management District (YSAQMD) to becoming a dedicated bike commuter, and ushering her entire family—a husband and three robust boys—into the biking lifestyle. How did this happen? Maria Contrera Tebbutt, founder and director of The Bike Campaign, a nonprofit which partners with YSAQMD, asked Tan what was keeping her from riding her bicycle to work. Tan confided that she didn’t know what route to take. Tebbutt rode with Tan and showed her the routes through the UC Davis campus. Tan was surprised at how fast and easy the bike commute was, and she has been riding ever since. YSAQMD offers its employees incentives for reducing driving and using “active transportation.” Tan bikes the 4-mile commute to work about half the time. The Tans moved from Natomas to Davis in 2017. “Davis’s community and culture, with its existing bike lanes, is so much safer than Natomas was,” said Tan. Although it’s not feasible for Tan’s husband, Hoa, to commute via bike, he rides with the family on the weekends. Their three boys, Ethan, 14, Matthew, 10, and Andrew, 5, have embraced active transportation. Ethan loves the increased freedom that riding his bike affords; Matthew enjoys walking to school, and is gaining bike confidence by practicing riding at his school on the weekends; and “Andrew is super enthusiastic about riding downtown to the grocery store, the farmers marketing and the library,” said Tan. In deciding what types of bikes they wanted to buy, the Tans asked themselves if they needed bikes for mostly in-town riding or for longer rides to Woodland and Sacramento. They decided that bikes for riding in town would suit them perfectly and ended up purchasing in-town, single-speed bikes at the Davis Bike Exchange, including a used bike trailer for their youngest, Andrew, when they needed to ride in heavy traffic. Tan also took advantage of Yolo Commute’s $100 bike grant via its Bicycle Incentive Program, offered every May, to purchase cell phone holders, bike lights and reflective shirts. Each morning, Tan asks herself, “Where are we going and what are we going to do today? Can we ride?” “Biking gives the family something fun to do together,” she said. Why I walk. I walk because I am a chicken. After having spent 10 years carless going everywhere on my bike until a fall left me with a broken metacarpal, I became car dependent for the next 30 years. Part of that was due to the need to commute, but part was sheer cowardice which persists to this day.I am afraid to fall. So I walk. I write only so that those who have not considered the possibility of extending their walking range or combining walking with the use of bus or train, might consider the possibility.